Posted by Christopher Brown on 13/09/2018 in General, Research Data Management Businesss Case and tagged #orgids, #pidapalooza, CASRAI, Crossref, DataCite, ISNI, Jisc, ORCID, OSIP, PID, PTCRIS, research, research data management. Posted by John Kaye on 06/12/2017 in Events, General, RDM shared services, Research data blogs, Research Data Management Businesss Case and tagged Embargoes, Forensic Science, ForSci, Licenses, Requirements Gathering, Survey, workshop. Posted by Bas Cordewener on 02/06/2017 in General, RDM shared services, Research at Risk, Research Data Management Businesss Case and tagged FAIR, research at risk, research data, research data management, research data policy. Posted by Christopher Brown on 16/03/2017 in General and tagged #software, preservation, research, sustainability. Posted by Christopher Brown on 18/01/2017 in #codesign16, codesign17, General and tagged ELN, research, research data, research data management. Posted by Dom Fripp on 12/12/2016 in General, RDM shared services, Research Data Management Businesss Case and tagged dataset, focus groups, metadata, report, researchers, workflow. 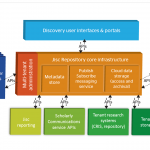 Posted by Dom Fripp on 04/11/2016 in General, Research at Risk, Research Data Discovery Service and tagged data, discovery, Findability, Google, markup, metadata, research, Research Data Alliance, schema.org. Posted by Christopher Brown on 16/09/2016 in General, Research data blogs and tagged #RDAUK, event, research, research data, workshop.